Open plan living isn’t for everyone. Whilst it’s great for entertaining or having the family round it can sometimes be impractical, especially when you want a little privacy for watching your favourite programme, just want to curl up with a good book or prefer to keep cooking smells confined to the kitchen. If you want to enjoy all the benefits of open-plan living without having to commit then you’ve come to the right place. 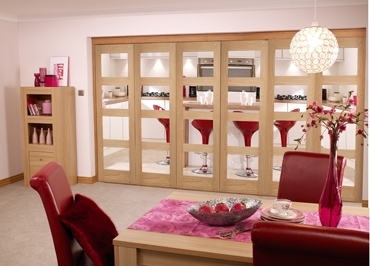 Here at Vibrant Doors, we offer a fantastic range of internal bifold doors which will allow you to open your home up, and section it off as and when you like. Our oak Shaker-style roomfold doors are the perfect choice for modern homes. Each door features a series of four clear glazed panels which allow plenty of light to filter through, even when the doors are closed, making it ideal for closing off kitchens from dining rooms and lounges. The particular system that you see on this page is available in 3, 4, 5 and 6 door options, making them perfect for any room size. Supplied unfinished, you also have the opportunity to apply your own stain, varnish or paint to these doors before you install them making it easy to match them with your existing windows and doors. The top hung system is incredibly easy to install and requires no unsightly tracking at floor level. The doors are supplied with a frame pack, hinges, running hardware and head track in an easy to assemble kit. The frame itself is also supplied unfinished to allow you to match it to your existing skirtings and architraves. All our systems are offered without handles or drop bolts to allow you to match existing ironmongery in your room. Whilst we offer a variety of standard door sizes we understand that not all openings will adhere to our standard sizes. If you require size or fitting advice, please don’t hesitate to get in touch with the team who would be more than happy to offer advice.